Sputnik got in touch with Captain of the Syrian Army Antoine Abboud, who is currently in the old district of Eastern Aleppo and he shared his side of the narrative. Earlier in the day, the Russian Defense Ministry said that all eastern Aleppo districts had been freed from terrorists, while some hotbeds of militants’ resistance remained. “I don’t know what has been happening in the media. I could not watch the television. The soldiers don’t have the internet; they don’t know what is being said. What we do know is that when we came to Aleppo the situation was bad. One of my soldiers was killed,” Abboud said. He further said that in the Old City there was one woman who got sick. The soldiers called the army doctor and he said that she was in dire need of surgery, “The doctor started the surgery right away in order to save her life,” the captain said. “People asked us [the Syrian Army] for food, we provided them with food. One soldier was carrying an old man on his back,” Abboud recalls. Talking about the battle for Aleppo, the captain said that al-Nusra terrorists had been behind the killings of civilians in Aleppo. “I just want the truth to come out. I don’t know what the internet is saying, what the television is saying. I just care about the truth and we came to help our people,” the captain said. He further said that the US was helping al-Nusra. “Al-Nusra [Front] has TOW rockets, where could the terrorists get those from? They have American food, American weapons, American medicine etc.” The Syrian Army soldiers found all of this when they came to liberate eastern Aleppo. He also added that the Al-Nusra terrorists shelled a Russian clinic, in which two Russian doctors were killed. 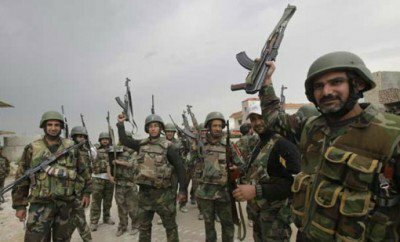 “Now it has been five years, we did not want to take over the city because there were civilians, <…> women and old people residing in Aleppo,” the captain explained why the Syrian Army was careful in its operation. “There were no Russian jets during last month’s battle,” he added. Syrian Arab Army celebrating victory in Sheikh Saeed, East Aleppo. Abboud said that the district in which he is located right now is peaceful and quiet. However, there are many houses which are in bad condition and many of them have been completely destroyed. which is held by insurgents, Syria December 15, 2016. “When the Syrian Army came to Aleppo we provided the people with temporary shelters. Right now renovation has started in the Old City district of Eastern Aleppo. There is food and water. The Red Cross has arrived and there are doctors, ambulances, bread and water for the people,” the captain concluded. When commenting on Aleppo’s liberation, the Russian envoy to the UN office in Geneva said that claims about alleged “atrocities” committed by the Syrian army are a “fake.” At the same time, crimes committed by militants controlling eastern Aleppo were confirmed, he said.